Disclaimer – there is not that much woodworking involved in this project, but I still want to post it to share the memories. I wanted to instill in my kids the fact that homemade gifts mean more to most people than anything that can be bought in a store. So on Saturday morning I packed them up and headed to Pat Catan’s where we spent about an hour picking out supplies for these projects. 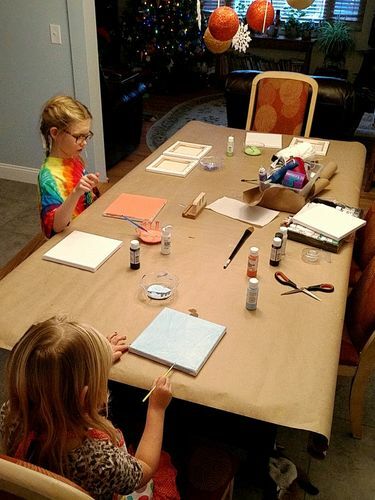 We started on Saturday afternoon by wrapping the dining room table with paper to avoid any dad freak-outs due to spilling, and then set up 4 different painting stations. Each of the girls got to paint the four different colors onto the canvas wraps, and then we took a short break to watch some christmas movies while they dried. About an hour later they were ready to add the tree trunks. 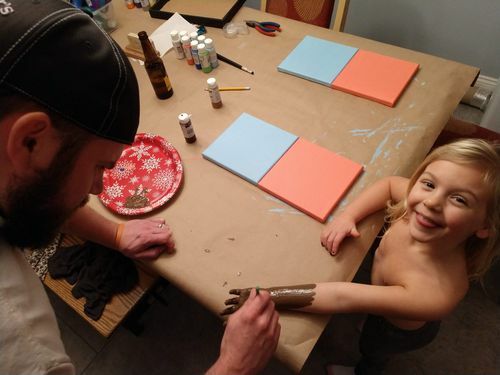 I painted the girls’ hands brown, which tickled them both nearly to death, and then pressed them onto two of the canvases. Luckily Mommy came home for lunch and was able to snap a couple action shots. Afterwards, we let those dry and went back to the Christmas movies. Once dry we finishing the 4 wraps with a dabber and various colors to represent the four seasons. These will end up being gifts for both sets of grandparents, and hopefully will get displayed in their homes. 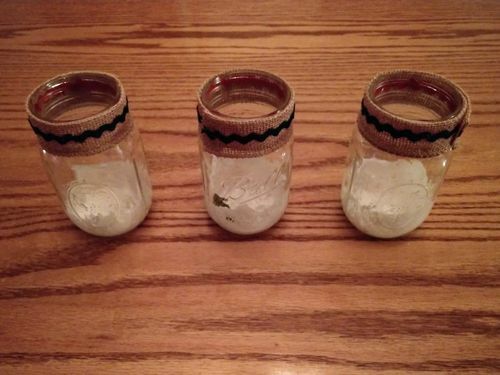 The second craft that we started on Sunday are 4 different sets of luminaries made from Mason jars. I painted the bottom of the insides with a Snow-Tex glue and the girls sprinkled them with glitter. Then we cut out burlap ribbon to wrap the tops with. The top wrap is held in place with a little bit of hot glue. Then the girls helped me separate the various pine needles, berries and pine cones that would be attached to the top. Because the wrapping was tedious, I let them enjoy some hot chocolate while I attached the top ribbons. Then they got to have a little more fun by using the fluffy Snow-Tex glue on the top. It didn’t really adhere very well, so they made a little more of a mess than what I was expecting… Good thing we wrapped the table before starting! When we were done, I made sure to have them take a second to admire all of the work we completed. I truly believe that is as important as doing the work- taking the time to enjoy it and understand the feeling of pride that comes with it. And as an added bonus, our Christmas gifts are finished for our family, too! Thanks for looking, and a Very Merry Christmas to all the LJs out there. lessons well taught.looks like dad had as much fun as the kids.memories that you all will remember forever.great job tooch. That’s being a great dad Tooch. Like you said, not much wood but getting them involved with their hands will lead to more crafted things. Nothing like getting together with family to learn and enjoy each others talents! 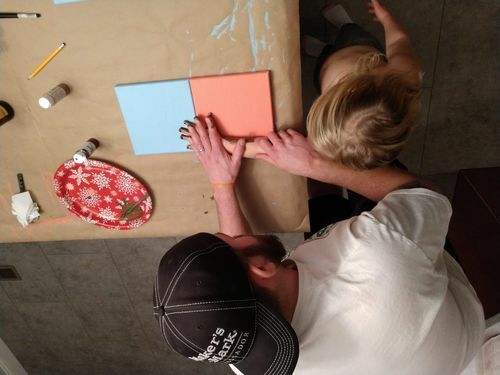 This is a great post Tooch thank you for sharing this with us….. You are a great dad and a great family man! Indeed great memory and priceless time spent together. What a great project with kids. Nice going, Mike!! Always awesome to work with the kids and have them involved in the process. Hope all was well received.